When the folks at Superior Bidet asked if I’d be interested in trying their top of the line easy-to-attach bathroom bidet, I jumped at the chance. I only agree to review products that I would actually use — and I’ve wanted to try a bidet for years! It seems like such a clean, refreshing, and simple way to clean yourself after using the bathroom. Someone who is overweight or cannot reach far enough to wipe properly. Forgetful or elderly people who might not be as interested in their own personal hygiene. Anyone with arthritis or a loss of dexterity in the fingers or hand. Here’s an interesting demonstration showing why wiping with toilet paper is not as effective as cleaning with water. Following is my detailed review of the Superior Bidet Supreme — it’s a high-quality bidet attachment that turns your regular toilet into a bidet toilet! 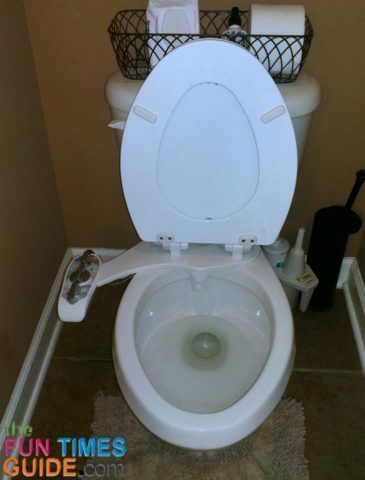 It works with all makes and models of toilet seats. It doesn’t matter if you have a round toilet seat, an oblong (elongated) toilet seat, or even an RV toilet! No electricity or batteries are required. It works with water pressure only — so simple! You select the pressure of the spray by turning the knob more the right or more to the left. It looks high quality and professional — rather than cheap and plasticy like add-ons typically look. You don’t need to buy any extra parts to attach this DIY bathroom bidet. You just need a screwdriver and a wrench! The Superior Bidet is super easy to turn on and off while seated on the toilet. You don’t have to turn around or reach high up on the toilet tank in order to operate this bidet attachment. It’s simply a matter of reaching to your right thigh area and turning the dial/knob (at seat-level, where you can easily see it) to the right to clean the rear or to the left to clean the front. There’s a cleaning dial (right next to the front/rear dial) on this add-on bidet that allows you to quickly and easily clean the spray nozzles before and/or after each use. The self cleaning jet shoots water straight down to clean the nozzles. Works for males and females. 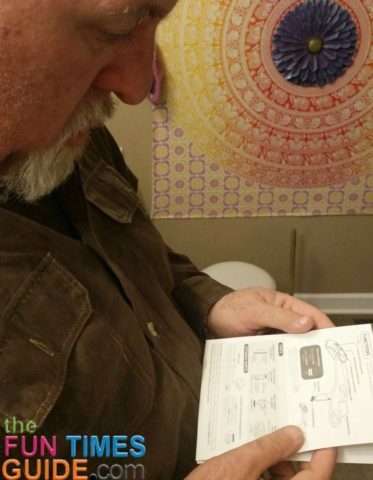 I thought my husband would turn his nose up when I asked him to help me install this bidet attachment — but he didn’t. Turns out he was just as interested in seeing if it would clean easier or better than toilet paper as I was! The Superior Bidet attachment has 2 separate spray nozzles to reach the front and back separately, on demand. The spray nozzles retract — so they’re entirely encased and protected on all sides within a large plastic shield when not in use. (That way, if someone has a ‘blowout’ in the bathroom, the nozzles won’t get splashed.) The only time the nozzles are exposed is when the bidet is actually turned ON. Once you attach it to your toilet seat, there is nothing more to do to maintain this bidet attachment over time. It is self-cleaning and doesn’t require any filters, electricity, batteries, or anything else. 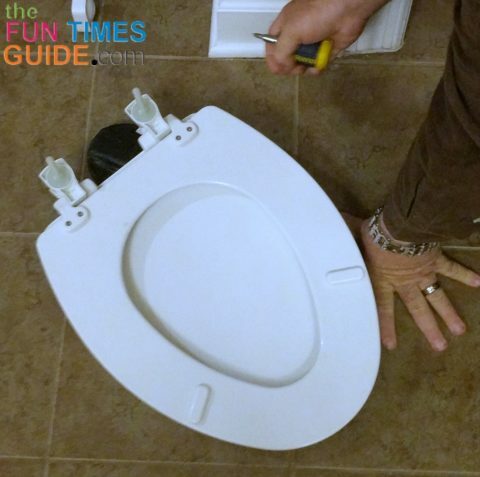 If you get a new toilet (or you want to move the Superior Bidet to another toilet in your home), it’s easy to remove and attach it to a different toilet reusing the exact same parts. Even if you’re renting a house or apartment, you can use this DIY bidet attachment while you’re there, and take it with you when you leave. There will be no trace at all that an add-on bidet was one installed there. If your toilet is located in a very small powder room like ours is, it will still work! (I swear we have the smallest powder room I’ve ever seen.) The control knobs extend about 5 inches out from the left side of the toilet seat (which is the right side as you’re seated). Here are the top 10 reasons to use a bidet. Other than tilting the nozzle plate more forward or backward as previously mentioned, you can’t adjust the angle of the nozzles themselves. Instead, you adjust yourself on the toilet (sit more toward the front / back, or sit more to the right / left) for “spot cleaning”. They say you can “install it in minutes.” For hubby and I, it was closer to 1 hour. The reason: at first we couldn’t get the toilet seat bolts tight enough to prevent it from loosening every time we sat on the seat with the bidet underneath the toilet seat as instructed. And it took a few tries to get the nozzles perfectly centered so they would spray precisely where they should. We eventually got it right. At first I was a little intimidated to use this bidet attachment. I mean, the blast of water is super powerful — I guess that’s so it can reach the parts it needs to reach and effectively clean those areas. Yes, you can turn the pressure from low to high, but it’s still a powerful spray. In order to have warm water, you need to have a pedestal sink within a few feet of the toilet. (We don’t – ours is in a powder room in our master bathroom.) If you have a vanity sink, you’d have to drill through the cabinet in order to attach the bidet to your hot water faucet. Without using the hot water function (we aren’t, for the reason mentioned above), it’s a cool blast of water that hits you. It’s not too uncomfortable… just noticeable (and not something you want to do for too long). As a female, I wonder about the likelihood of water sprayed at the rear inadvertently splashing the front at the same time — thus increasing the possibility of a UTI. There are “experts” talking about both sides of the issue online, but nothing solid in terms of research. In my experience while using this bidet attachment, my front definitely gets splashed when I’m only activating the rear nozzle. Initially, I was excited that I’d “never have to use toilet paper again.” But that definitely won’t be the case — for the reason mentioned above (needing to pat dry after each use). The folks at Superior Bidet say, “It cuts down on toilet paper consumption by 75% to 100%“… which I think is much more accurate. The Superior Bidet is only available in the color white. So if you happen to have an off-white colored toilet, this bidet attachment won’t match perfectly — but I don’t really think a white bidet attachment would be an eyesore either. It’s only available with the knobs/controls on the right side of the toilet seat — so lefties will have to get used to using their right hand to turn the bidet on/off. Here are the top 10 misconceptions about bidets. I’ll be honest, I had no idea there were so many easy-to-attach bathroom bidets on the market these days! I mean, I knew about bidet toilets… but not about bidet attachments. 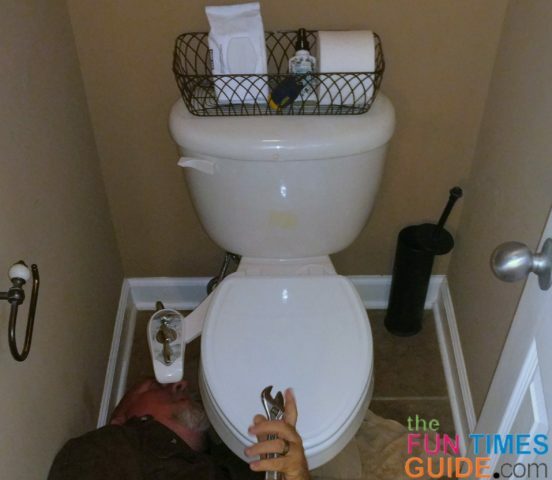 So I am thrilled to have found this simple DIY solution that turns your regular toilet into a bidet toilet. After my personal experience with the folks at Superior Bidet …AND after seeing how responsive and transparent they are when answering customers’ questions online …AND trying their bidet attachment firsthand, I can honestly say that I highly recommend this particular bidet attachment. I hope that you’ve found the pros and cons I’ve listed helpful when deciding if you might want to try an add-on bidet or not. Here’s a frank discussion about the wrong and right way to use a bidet.